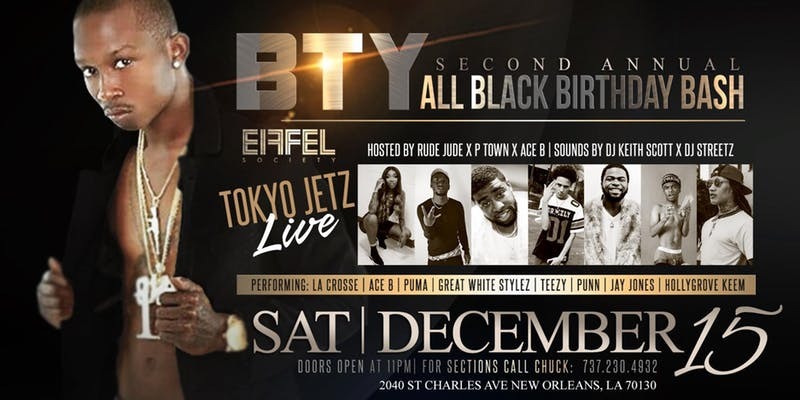 The event will be held at Eiffel Society in New Orleans, Louisiana and will celebrate the birthday and life of the late, great BTY YoungN. NEW ORLEANS - Dec. 6, 2018 - PRLog -- For the second year in a row, the family of BTY YoungN will host an epic celebration of the young artist's life. BTY YoungN was an upcoming music artist who was described as the "Next Up" from New Orleans when he lost his life to a violent attack on April 29, 2017. He remains one of the top young artists to date, having recently released two albums to wide acclaim. His family strives to keep his legacy alive through his music. BTY YoungN had a huge, international fan base at the time of his death that has only continued to grow by leaps and bounds. He was a hands-on artist who directed his career, along with his music team. Known for selling an usually large number of units following each and every release, BTY YoungN was most definitely headed to the top. Even following his death, he continues to receive media attention, as well as garnering sales of his projects that are currently being distributed through Rap Bay Distribution. More releases are planned in the near future, as BTY YoungN's fan base continues to demand more of his originals music. According to his mother, a large catalogue of unreleased music remains in the vault. Current releases entitled "The Best of BTY YoungN" and "2nd Feed Up" are available for downloading and streaming on all digital platforms, including iTunes, Apple Music, Amazon Music, Spotify, Tidal, You Tube, and more. BTY YoungN was a charismatic yet controversial figure in the entertainment industry. He had plans to own one of the large distribution networks in the South and he was well on his way to achieving that goal at the time his life was cut short. BTY YoungN was known to inspire the youth, making certain to instruct them to stay in school, get a solid education and be the best they can be at whatever life path they chose. His loss is still being felt by family, friends and fans around the world. He had a large following in the United States, South America and even Africa, with many of his fans continuing to post social media tributes to him weekly. His spirit continues to live on through his young son who definitely has his father's strong and well-loved personality and charm. BTY YoungN was a solo artist, as well as a member of the well-known group 0017th, hailing from New Orleans' infamous 17th Ward which has, over past decades, become known for birthing amazing musical, athletic and entrepreneurial talent. The Second Annual All Black Birthday Bash will be hosted by Rude Jude, P-Town Moe and Ace B, featuring perfomances by Tokyo Jetz, Lacrosse, Ace B, Jay Jones, Punn Da Pusha, Hollygrove Keem, GreatWhite Stylez, and Teezy. Sounds will be provided by DJ Keith Scott and DJ T Streetz. For ticket purchases, contact @mz.gabrielle via Instagram or on Eventbrite - https://www.eventbrite.com/e/bty-youngn-2nd-annual-all-bl.... For media inquiries, contact Publicist Arlene Culpepper of MIKODreamz PR via email at mikodreamzpr@gmail.com.